So I started watching this seasons So You Think You Can Dance and fell in love with Marko Germar right away. His story is just amazing living with a bullet in his shoulders (literally) and still doing what he dreams of doing. 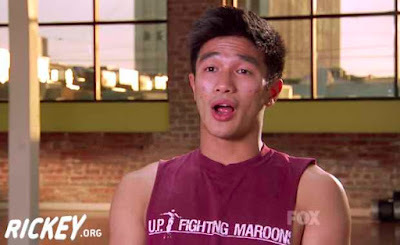 On tonight's episode I was shocked when he shows up on his rehearsal clip wearing a UP Fight Maroons shirts which is the University of the Philippines and i fell in love with him more representing the Filipino Pride. SO CUTE!! !